Youre the first police officer to arrive at the scene: a suspected ecstasy lab. Theres drug paraphernalia everywhere, but which piece of evidence could be most helpful for your investigation? Then, a massive virtual arrow appears, pointing out a bottle of chemicals, accompanied by a note saying: Bag this please. Dutch police are trialling an augmented reality (AR) system that streams video from body cameras worn by officers to experts elsewhere. These experts can then guide the officers by annotating the scene virtually with notes that the officers can see on a smartphone or head-mounted device like Google Glass. We now have good enough software and hardware to use augmented reality at crime scenes, says Dragoş Datcu, principal researcher at AR company Twnkls in Rotterdam, the Netherlands. 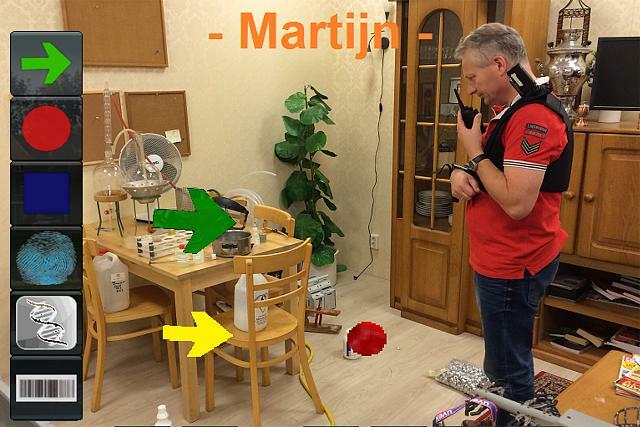 Datcu and his colleagues at the Delft University of Technology have been developing the AR system for five years and have now tested it in collaboration with the Dutch Police, the Netherlands Forensic Institute and the Dutch Fire Brigade. In six months, the police will be able to buy the complete package, he says. When an officer arrives at a crime scene, it is often important that they explore it immediately there could be a suspect hiding, or a dangerous chemical giving off toxic fumes. But the first person there is not necessarily the most qualified to investigate. The new system aims to allow the most relevant experts to get actively involved in the search, even if theyre hundreds of kilometres away. Using the prototype, a police officer can view an AR version of the scene in front of them on a smartphone or head-mounted device. As they explore the area, footage from a camera on their vest is sent to people at different locations, such as forensic scientists or chemical specialists. These remote colleagues can add information and notes to the officers AR view, ranging from a request to explore a particular area to a big arrow saying body here. Its a similar principle to the Pokmon Go smartphone game, which allows players to catch virtual creatures that appear transposed over the real world when viewed through a smartphone. Weve tried the system and it really adds a lot of value to many different areas of policing, says innovation adviser Nick Koeman from the National Police of the Netherlands. The technology isnt suitable for use when making an arrest, Koeman says, because officers trialling the system sometimes found the additional information distracting. But it is ready for more routine aspects of policing like crime scene investigations. The technology makes it possible to get the right information to the right people at the right time, in a way thats easy to see, he says. While it would be preferable to have a team of the most suitable investigators search every site in person, this isnt always possible because of time and cost constraints. The system could also keep numbers at a crime scene to a minimum without sacrificing thoroughness. The more people you have at a crime scene, the more likely you are to find important evidence but you also raise the risk of accidentally contaminating evidence. With AR, many people can help uncover clues without physically touching anything. The recordings from the system could also potentially be used in court. The advantage of augmented reality is the potential ability to recreate a crime scene for a jury, says Michael Buerger, professor of criminal justice at Bowling Green State University in Ohio. However, Buerger says there are likely to be legal challenges the first time AR is used as evidence. This was one of the first things I thought of when I saw the HoloLens. Great for measuring and annotating a crime scene. Tango would be good for that, too. A good 360 camera rig would also make it so that the scene is preserved in a photograph that is easy for people to understand. Normal photos may give portions of the story and be able to capture detail on smaller objects, but it would be good to have a couple of reference overview shots to get an idea of scale and placement. Nice. This reminds me of viewing echoes in The Division. The update of the Dutch police from PlayStation 3 to PlayStation four is welcome. You have a great point, I was thinking about the limitations of the price for the whole police departments all over the world, but if something like the Lenovo Phab can do it, maybe the tech is not as expensive as I believed. This, is absolutely fascinating. I love watching as VR and AR evolve and are used for something other than entertainment. Makes me wonder where we'll see something like this pop up next.